Because of that addiction, we all have our tastes narrowed down to exactly what we like. We’re connoisseurs of java. Your fix may be a coffee regular: cream and sugar. Or maybe coffee black. Or maybe coffee black, with two Splendas on the side, because, you know, you’re watching your carbs. Or maybe it’s a Quad Grande Caramel Machaido with steamed milk? Who knows? No matter what it is, you know what you like, and you look forward to it every morning. If you’re like a lot of Americans, you’re getting away from traditional coffee drinks and heading for things like espresso. If that’s the case, you know how expensive they can be. Some of the drinks can (seriously) run you in the $10 range with enough extras. You can save yourself a lot of time, money, and hassle in the long run by buying your own espresso machine. If you want to find the best espresso machine on the market, you’ll need to keep a few key things in mind before making your purchase. Let’s take a look at a few of those things. 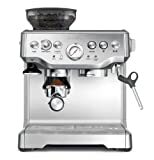 To know what you need to know in order to purchase the best espresso machine possible, you’ll have to have a little background on the machines themselves. Knowing where they came from, what the intention was, and what goes into making a good machine will help you be better informed. If you’re like a lot of Americans, you know that you love the sludge, but you don’t have time to get into all of the who, what, where, when, how, and why’s. So, let’s start off with some basics. An espresso machine – the name refers to two things: personalized and fast – is just like any modern machine that’s revolutionized (or maybe just improved) our lives: it’s very simple. 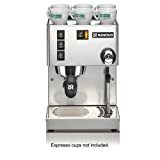 An espresso machine does nothing more than brew coffee by forcing pressurized water near boiling point through a “puck” of ground coffee in a filter in order to produce a thick, concentrated beverage of caffeine. You can think of the machine in sort of the same way we think of a pressure cooker: high heat, high pressure, high quality product, short amount of time. The machine originated in Turin, Italy in 1884 by a man by the name of Angelo Moriondo, and was a mainstay in Italy ever since. Coffee has been a stable in American culture since the founding of the country. Because we are Americans, hard work was inbreed in us from the start. To get a good jump on our day, we needed something to pick us up and get us going. Coffee did that. It also helped our ancestors warm up quickly on those cold mornings in log cabins during harsh winters. It still serves those two purposes to this day, but it has also morphed into something else entirely. Now it stands for more than just practical purposes of generating heat and energy for us, it has a social status attached, as well as a habit just as near and dear to us as reading the newspaper. Espresso started coming to the spotlight in the 1980’s in coffee shops and cafe’s throughout the country. The Pacific Northwest – Washington and Oregon specifically – are credited with bringing this Italian favorite to the American mainstream. As Starbucks became the go to place for congregating with friends, political discussions with strangers, and meeting potential relationship partners, the espresso became the go to drink of choice. You can now order these drinks in sizes that range from single (one shot) to a quad (four shots), and in sizes from a regular to a grande. You can add milk, caramel, whip cream, cinnamon, or just about any other flavor your heart desires. Price – I mention this first because it’s always at the forefront of a consumer’s mind. Unless you make a very good salary and are well off enough to do/buy whatever you want, price is going to be the first thing you think of with any significant purchase. The truth about espresso machines is that they are generally not very cheap. Sure, you can get some for under $100, but you also get what you pay for. And if you’re wanting to fabricate a cup of jo that resembles that of your favorite coffee shop, going cheap is probably not in your best interests. They can range anywhere from under $100 up to over $2,000. The machines contain very small, very specific parts, and the expensive ones are usually hand made in Europe. Although price should be a consideration, keep one thing in mind: you’re probably going to be using this thing every day for the next decade or two, and if you take the price of buying an espresso five days a week over the same 10 or 20 years, you’ll save a significant amount of money by buying your own. Plus, you have the luxury of trying new things and tweaking the beverage to exactly your specifications. Manual vs Automatic – Once you have the price range you’re willing to go to, the next thing you need to decide is whether or not you want an automatic or manual machine. There are four kinds of machines: manual, automatic, semi-automatic, and super-automatic. They range from you doing everything yourself (setting temperature, grinding, dosing, ejecting, etc. ), to having to do nothing more than push a button. The semi-automatic machines seem to be the most popular, as they allow for some control, but won’t need nearly the attention a manual machine will. 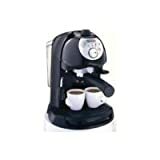 There are also steam driven machines that are mistakenly considered the fifth kind of espresso machines, but in reality they are just machines that produce a very strong cup of coffee. They can be compared to a Moka pot. Accessories – Once you’ve figured out how much you want to spend, and what kind of machine you want, you’ll then want to consider accessories. Things like a Tamper can be the difference between having fun making your coffee, or it becoming a chore. A good tamper can help you be more precise when you press down on your coffee for thickness and strength. They can run anywhere from a few dollars to over $100. You also want to consider things like cups, saucers, knock boxes, and pitchers. All of these can enhance your espresso making experience, but beware, you can drop a fortune into a machine and accessories if you aren’t careful. In the end, you have to decide what’s best for you and your specific needs. Having the best espresso machine for you is possible with a little history and research. We’ve provided seven machines below for you to consider. Take a look, and enjoy that cup of jo!